What is FAS doing to make its operations easy, efficient and modern? How is FAS delivering best value mission support to customer agencies? What is FAS doing to promote smarter buying and the efficient use of technology across the federal government? Join host Michael Keegan as he explores these questions and more with Alan Thomas, Commissioner, Federal Acquisition Service (FAS) at the General Services Administration. How does the work of the Government Accountability Office advance public service? What are some of the key leadership challenges facing U.S. federal agencies? Join host Michael Keegan from the 2019 ASPA Annual Conference as he explores these questions and more with Robert Goldenkoff, Director, Strategic Issues, Government Accountability Office. What is the Senior Executives Association? How does it seek to build a leadership pipeline for U.S. federal agencies? Join host Michael Keegan from the 2019 ASPA Annual Conference as he explores these questions and more with Bill Valdez, President, Senior Executives Association. What will government be in 2040? How will it operate? The IBM Center for The Business of Government convened a panel discussion envisioning government operations 20 years into the future. 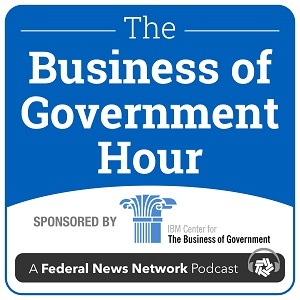 Join host Michael Keegan for a special edition of The Business of Government Hour as he explores the vision of government in 2040 and beyond. How does The Women In Military Service For America Memorial commemorate the courage and sacrifice of the female members of the U.S. Armed Forces? Join host Michael Keegan as he explores this question and so much more with Retired Major General Jan Edmunds, Chairwoman of the Women In Military Service For America Memorial foundation. How does National Academy for Public Administration (NAPA) fulfill its mission solving governments' most critical management challenges? What is NAPA's Grand Challenges in Public Administration program? Join host Michael Keegan as he explores this question and so much more with Terry Gerton, President and CEO, National Academy of Public Administration. This week Michael Keegan addresses the federal government's IT modernization priorities with Suzette Kent, OMB's Federal Chief Information Officer. Leadership stories are at the core of The Business of Government Hour. Join host Michael Keegan in the second of a two-part series exploring the leadership stories and public service of nine government leaders encompassing a wide range of disciplines, a diverse set of experiences, and a vast span of geographies. This edition introduces 5 government executives leading missions and programs that include government-wide acquisition, science and technology, commerce, children and family services, and innovation. Leadership stories are at the core of The Business of Government Hour. Join host Michael Keegan in the first of a two-part series exploring the leadership stories and public service of government leaders encompassing a wide range of disciplines, a diverse set of experiences, and a vast span of geographies. This edition introduces to four government executives leading missions and programs that include military health, government-wide acquisition, technology and innovation, and environmental protection. How is the Veterans' Appeals process changing? What are the key priorities for the VA Board of Veterans' Appeals? How is the implementation of the Veterans Appeals Improvement and Modernization Act of 2017 going? Join host Michael Keegan as he explores these questions and more with Cheryl Mason, Chairman of the Board of Veterans' Appeals within the U.S. Department of Veterans Affairs.